Send the guys packing for the night and grab your lady pals for a fun after hour get-together at home. 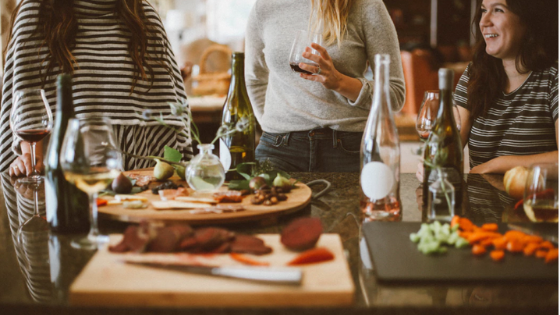 Nothing kicks the boredom blues of the winter season quite like a gathering of girlfriends for laughs, food, and bonding. Make your ladies' night in your Houston apartment a memorable occasion with these festive ideas! Spa nights can be a lot of fun, and guests can walk away feeling a little refreshed. Finger foods and appetizers are good for these types of gatherings, so don't forget to create a nice menu of different easy-to-munch-on foods. Everyone's heard of clothing swaps, but a home decor swap can be a great way to spend your next ladies' night. Instruct your best lady friends to bring along a box of things home-decor related that can be traded. Sip on some wine and enjoying time together during this mini swap meet! This idea can coincide with other activities because the food is a must-have anyway! Tasting parties are all about trying new foods you may have not had. Every guest can bring along a dish or appetizer they believe is unique. For an added dash of fun, you can choose a culture to inspire your dish and have all guests attempt to guess what part of the globe it hails from. Hang-out time is important, but making that time together enjoyable is even more beneficial! Reach out to us to learn about the apartments we have available that would be ideal homes to host your next ladies' night event.